With the abundance of museums in L.A., it can feel like you need the cash of a long-lost Getty family member to splash out for every single one. While paying for a museum admission might be one of the better ways you can spend a few bucks, it still adds up. Free museum days encourage you to visit a place you’ve never explored, return to an old fave, or just dip in to get a quick hit of culture without feeling like you need to make a full day of it to justify the fee. We’ve compiled the free museum days in this guide below, but don’t forget that many of the city’s museums are free all the time. Learn a bit more about the American West at this special museum tucked inside of Griffith Park. Entry is free all day on the second Tuesday of the month thanks to an ongoing partnership with Wells Fargo Bank and Sony Pictures Entertainment. 4700 Western Heritage Way, Griffith Park. A visit to the lovely library, art collection, and gardens at the Huntington is an essential experience, but if you want to do it for free, you’ll have to plan ahead. Tickets for the first Thursday of the month are free–if you can snag them. Book in advance online as soon as they become available; the allotment of free passes for the month may be fully committed in less than two minutes. 1151 Oxford Rd., San Marino. Learn more about the Japanese American experience when you take advantage of free museum days on the third Thursday of the month and from 5 to 8 p.m. other Thursdays. The museum also hosts a free family-oriented festival on Saturday, November 10, featuring a full day of kid-friendly activities. 100 N. Central Ave., Little Tokyo. Free Family Nights take place on first Tuesday of each month, from 4 p.m to 8 p.m. and include special monthly programming on topics from outer space to diverse holiday traditions. 480 N. Arroyo Blvd., Pasadena. Explore the La Brea Tar Pits for free on all day on the first Tuesday of every month (except July and August). Los Angeles County residents with valid ID can also get in for free every Monday through Friday from 3 p.m. to 5 p.m. Admission is free at all times for California EBT cardholders, teachers, and active or retired military. 5801 Wilshire Blvd., Mid-Wilshire. 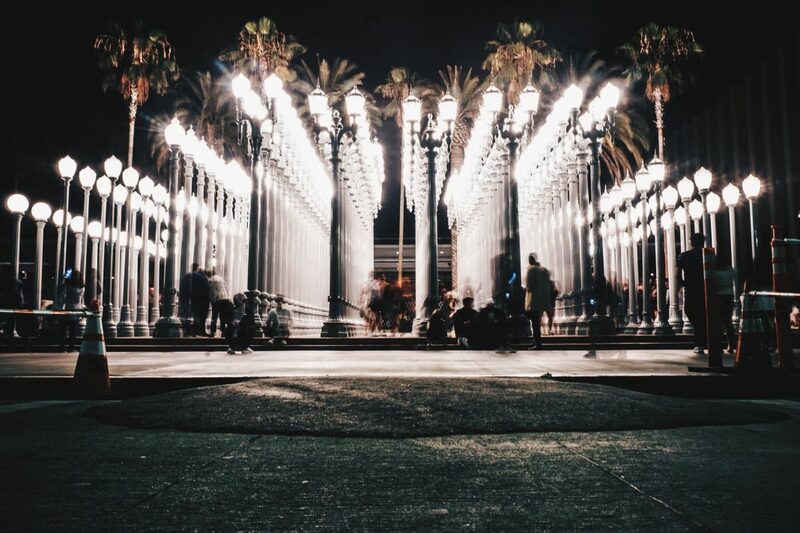 If you have a Los Angeles County ID, you can get into LACMA any time after 3 p.m. on weekdays. That includes Friday evenings, when the museum stays open until 8 p.m. and often hosts music and live events. Kids 17 and under are always free as well. 5905 Wilshire Blvd., Mid-Wilshire. The main campus of LBMA is open for free 3 to 8 p.m. on Thursdays. Fridays are half-price admission, and half-price admission is also available with a receipt from dining at the on-site restaurant Claire’s. The LBMAx gallery at 356 E. 3rd Street (formerly known as ARTX) is free at all times. 2300 E. Ocean Blvd., Long Beach. Experience some nature without straying too far from the city. The arboretum does not charge admission on third Tuesdays of the month, though there is a catch: on free days, they do not offer guided tours or tram service inside the park. 301 N. Baldwin Ave., Arcadia. MOCA Grand and MOCA Geffen offer free museum days on Thursdays from 5 p.m. to 8 p.m. but be sure to check their website for any updates; MOCA Geffen is currently closed until November 11. (Oh, and here’s one perk to jury duty: both DTLA museums offer free admission with your juror ID badge.) 250 S. Grand Ave., downtown; 152 N. Central Ave., Little Tokyo; 8687 Melrose Ave., West Hollywood. Opportunities to visit MoLAA gratis abound. Entry is free every Sunday all day, and the fourth Thursday from 5 to 9 p.m. Kids 12 and under get in for free any time, too. 628 Alamitos Ave., Long Beach. Enter the NHM for free on all day on the first Tuesday of every month (except July and August). To ensure you get in, they suggest booking your free tickets online in advance. Los Angeles County residents with valid ID can also get in for free every Monday through Friday from 3 p.m. to 5 p.m. Admission is free at all times for California EBT cardholders, teachers, and active or retired military. 900 Exposition Blvd., Exposition Park. Visit the collection and gardens of the Norton Simon Museum for free on the first Friday of the month from 5 to 8 p.m. Admission is also free any time for those 18 and under, students, EBT cardholders, employees of other museums or media outlets, and members of the American Alliance of Museums or International Council of Museums. 411 W. Colorado Blvd., Pasadena. The Skirball’s galleries and installations are free every Thursday, with tickets available first-come, first-serve at the door (check the website for exceptions, particularly around holidays). Admission is free any time for EBT cardholders, school teachers, active duty military, police officers, firefighters, and clergy members. 2701 N. Sepulveda Blvd., Brentwood. Known as “the jewel of the peninsula,” this South Bay facility is home to abundant native flora and fauna. Visit on the third Tuesday of each month to get your fix of hydrangeas and hummingbirds for free. 26300 Crenshaw Blvd., Rolling Hills Estates. If you haven’t visited the USC PAM since it reopened after an extensive renovation, use a free admission day as an excuse. The general public can visit for free Thursdays from 5 to 8 p.m. and any time on the second Sunday of the month. 46 N. Los Robles Ave., Pasadena.